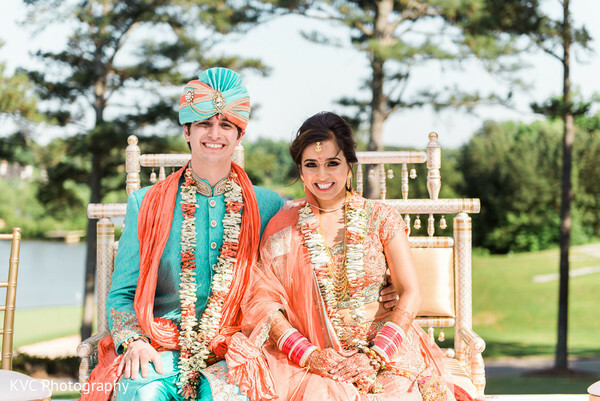 The magnificent Indian fusion wedding ceremony Envi Event Planning planned for our wonderful couple was held outdoors at the dazzling Sugarloaf Country Club! 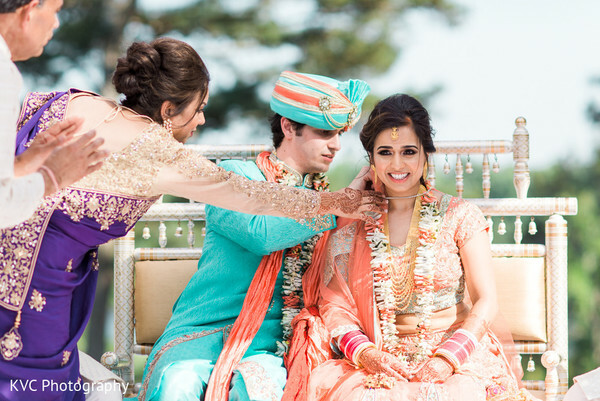 Weddings InStyle provided the lovely decorations for the event, while Beauty You Deserve's incredible mehndi designs made our Indian bride look all the more beautiful! 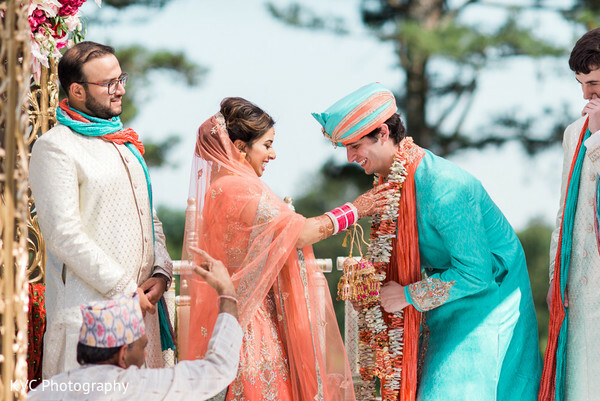 With her aqua and coral lengha by Image Boutique Shop By Surinder Bedi and flawless hair and makeup by Gunn Glamour Hair, Makeup, & Bridal, the Maharani was the picture of Indian wedding perfection! See the moving ceremony KVC Photography expertly photographed below and in the full gallery! 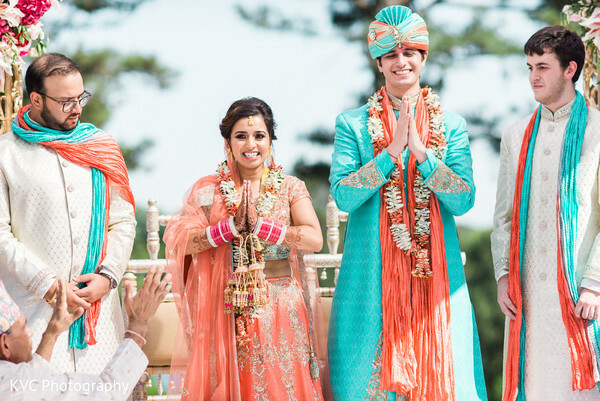 "My husband was really looking forward to having a big, colorful, Indian wedding. 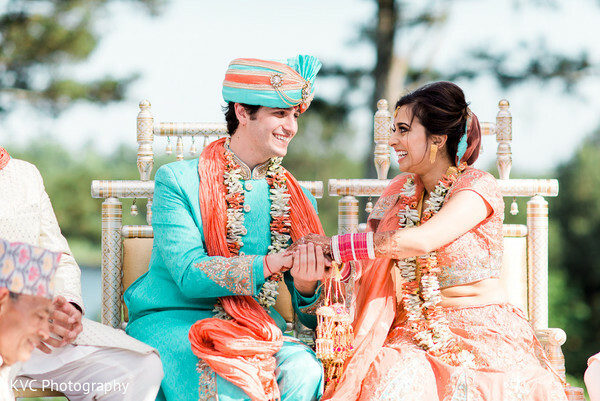 As such, he decided he did not want to wear a gold or ivory sherwani, but instead chose to wear teal. 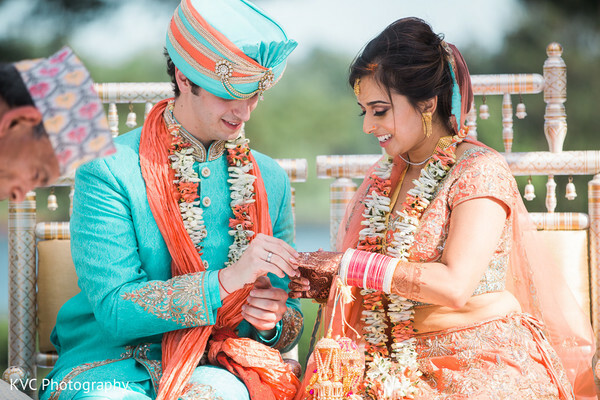 I had long since decided against red, and was considering magenta, but once he decided on teal, I decided that, since we had a daytime spring wedding ceremony, I would wear coral with teal and gold accents. I worked very closely with Surinder Bedi of Image Boutique Shop to develop my 2 wedding lenghas. Because I am relatively short, Mrs. Bedi helped me design both lenghas to make me look a little taller. My mom had bought me a gorgeous rani-haar gold necklace for the ceremony and Geoff had bought me a stunning diamond necklace in place of a mangal-sutra. 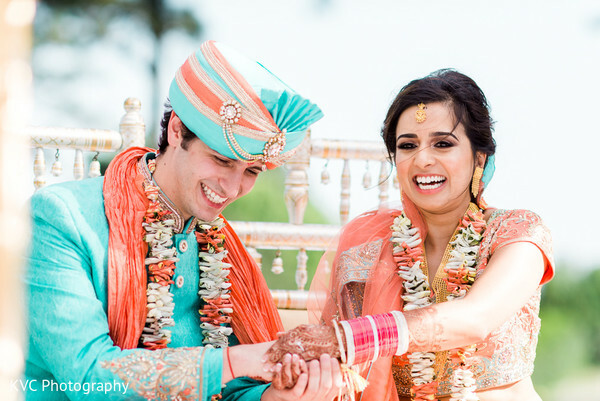 Mrs. Bedi helped me design both outfits to highlight my jewelry. I told her that I really wanted to stand out in my reception outfit, which I had chosen to be magenta, but also wanted some degree of florals. I showed her 2 outfits that I had loved online - one was kitchdi work with Swarovski crystals and sequins, and the other was beautiful floral embroidered lengha. She helped combine the two so that I had embroidered flowers on a bed of kitchdi work with Swarovski crystals that accented the diamond jewelry I wore for the reception. I truly felt like a Maharani in both of my stunning lenghas." Check out the reception, next! Weddings InStyle, Envi Event Planning, Beauty You Deserve and Gunn Glamour Hair, Makeup, & Bridal are members of the Platinum Guide. Love what you see? Explore their portfolios.